About 3 weeks ago, I did a Monday Morning Inspiration post on detachable, accent collars. You can see the post HERE. So many of you enjoyed the post, so I thought I would do a pattern to share with everyone. 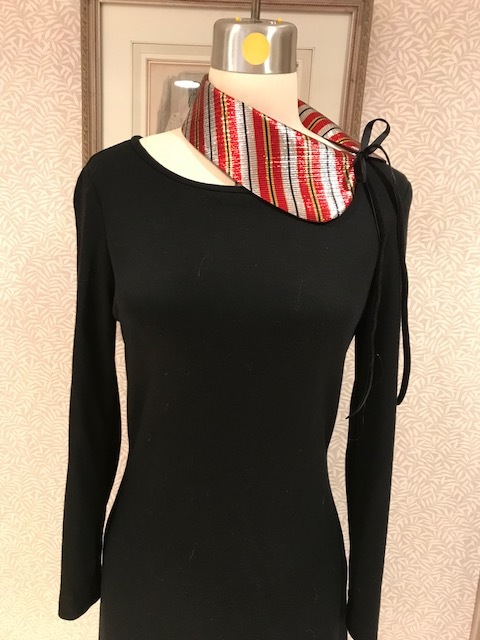 A detachable collar is something that is fun year round and can change the most boring of outfits. 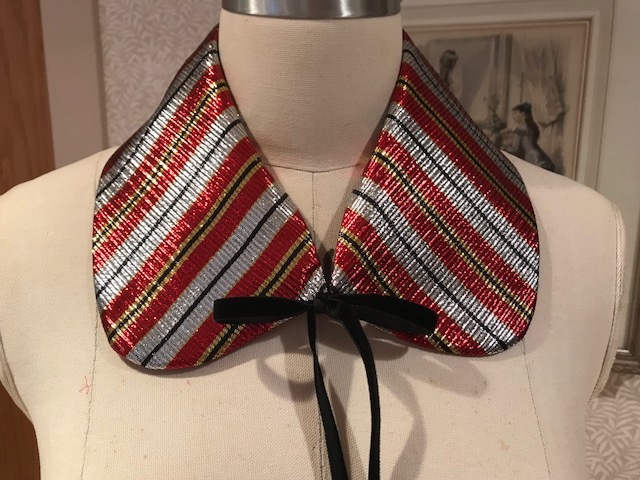 For the holidays, I did this super fun collar. This is the back side, so it's like having 2 collars in one. Here, paired with a simple black wool knit dress. 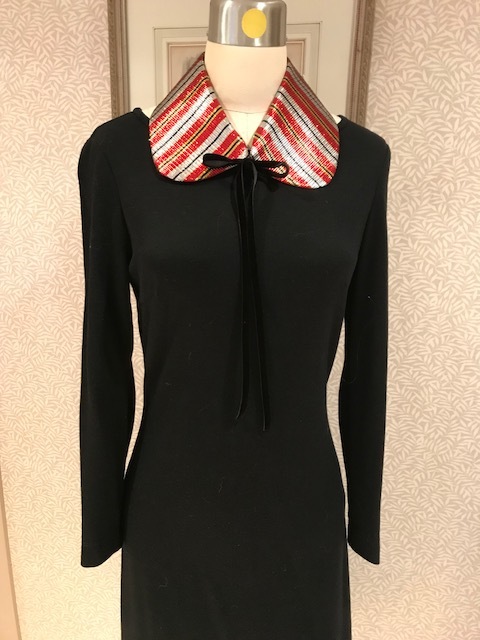 What's fun about the collar is that it can be worn traditionally as above, turned to the side as below, and even turned to the back for another cute look. You can download the FREE PATTERN HERE. Just a word of warning, there are 2 sheets. Sadly, I couldn't get the collar on 1 sheet of paper, so you will need a tiny bit of tape. Somehow, I downloaded the pattern twice, so there are actually 2 patterns in the file. You may want to select just the first 2 pages rather than all 4. To make the collar, you will need 3/4 yard of ribbon for the ties. You could also do a button loop and a small button if you would rather not have the ties. A hook and eye closure is another option. ***1/4" seam allowances have been included in the pattern, so just cut and sew! 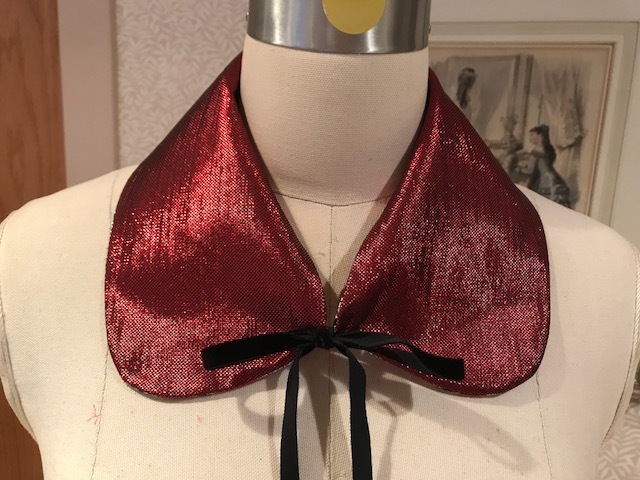 If you would like a video tutorial on making the collar, just let me know, I'll be happy to do one. The collars make great gifts, and they are fun to wear. Also a great way to use up scraps that are just too nice to not use. Monday Morning Inspiration/Is Santa Real? When we think of Santa, we think that he's a jolly, older man with a big sack of toys flung over his back. We think he's mystical, never really seen, but hoped for, at least for a time, until we become "wiser," and no longer believe. While at mass yesterday, our priest told a story of a "santa" who lives in Quebec, Canada. He doesn't deliver toys, he cuts hair. As the story goes, like the mystical "santa," he is jolly, kind, and has a beard. But his beard isn't white, and rather than a red suit, he is known for his distinctive tattoos. 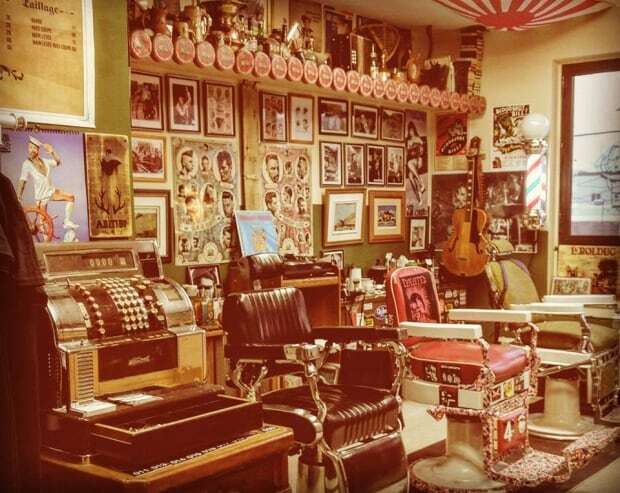 His shop is like a gingerbread house, but rather than candy, it's brimming with memorabilia that creates a sense of wonderment, a true treat for the eyes. The story of this "santa" began in desperation, a mother who needed to find someone who could cut the hair of her autistic child. Autistic children need understanding as cutting their hair can be traumatic, the touch of a hand in their hair, the sound of the scissors, and the bits of hair that may fall upon their face can all be too much to stand. But, it was a task that Franz Jacob felt he could take on. The appointments are scheduled for late in the day. The door is locked so no one will suddenly come in and shock the child. The lights are dimmed. Franz takes time to walk around the shop with the child and discover all there is to see, and then after a time, begins to cut the child's hair, but not in a traditional manner. He meets them where they are, and it may be lying on the floor. A haircut that would traditionally take no more than 30 minutes, may take up to 2 hours. He finds his reward in the smile of the child, and the look of relief on the face of a mother. His miracles not only take place in his shop, Franz reaches out to the terminally ill. He visits those who may only have another day or so to live and gives them one last trim, one last shave, and one last moment of feeling alive. 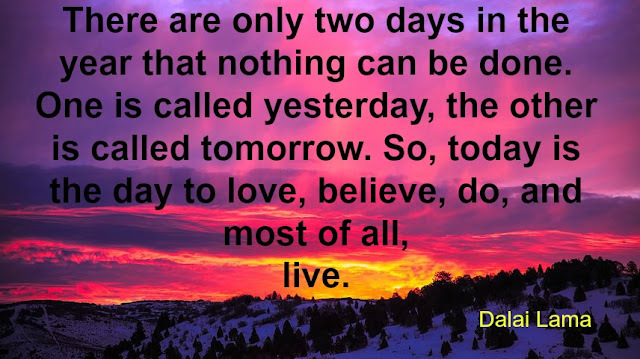 Regardless of our religious beliefs, we all long to believe that life is about so much more than just a typical daily routine. We long to see miracles. They are there, they can be seen, if only we look in a different way, if only we let go of the "wisdom" of age. So this season, if a child asks, "is Santa really real?," with confidence in your voice, you can say yes...yes, he is real. The magic can be experienced when we just allow ourselves to see the miracles that happen when one reaches out to another. The Final Sewing Caddy Winner, and A Birthday Present For Me! When I was in the second grade, there was a man who began driving around the school play yard and trying to lure children into the car. At 7 years old, I didn't understand the true implications of what he was up to, but I knew it was wrong. I remember being afraid for anyone who might get in the car, where would they go, and would they be able to get home? Of course the intentions of this man were far more dangerous and disastrous than I could possibly imagine. The older I get, the prouder I am of that little 7 year old girl...because she took a stand, and she told. The school nurse came to our house, I described the car and all that I had witnessed. I was scared, but I did it. That was a long time ago, and laws against sexual predators were not what they are today, so more than likely, he received a slap on the wrist, but I hope that my actions saved someone from harm. 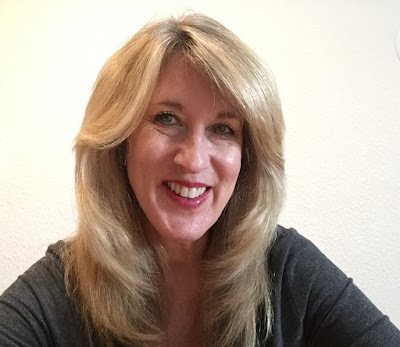 In case you don't know Joy, she blogs at Joyful Expressions and she is such a hoot! She does quite a few videos, and it's always fun to see what she is up to. So if you don't know Joy, be sure to go by and say Hi! 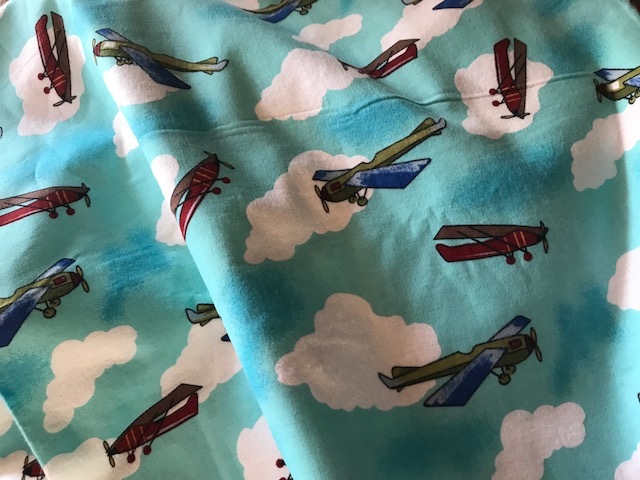 Flannel in my favorite color with airplanes!!! What a fun pair of pajama pants this is going to be. The fabric is in the washing machine now for pre-shrinking and as soon as it's dry, new pajama pants, WOOHOO! I'll share them next week. A few years ago, I saw 3 guys steal our neighbors boat. I was the only eye witness. When the day rolled around for the court hearing, I told my husband that I didn't want to go. He said he understood, and said that he was not going to make me go. Then he said, think about this, "how will you feel if you don't go?" I went, testified, and the criminals went to jail. Taking a stand is not always easy, but the reward of knowing that you did the right thing is always worth it. A Thank You, Paco's Top, and A Winner! A very heartfelt THANK YOU to so many of you who sent the warmest wishes for my birthday. I was actually a little overwhelmed. Good overwhelmed though :) There were emails, ecards, and messages left on the blog, Facebook, and Instagram... WOW!!! My day was a quiet one. When I left you yesterday, I said that I was headed out for a massage. Typically, I can't get in at the last minute, but my body was hurting, so I thought, give it a shot. Low and behold, there was an opening! I told my therapist that she was my birthday blessing :) So, I had the massage, and then came home and soaked in a hot bath. My husband brought dinner home for us. I then crawled into bed and continued reading a very interesting book. I'll share more about the book when I finish. It's one of those that's so good that you can't wait to see what happens next. So, all in all, I had a very relaxing, peaceful day. The top I am wearing is from Paco Peralta's new Vogue pattern, 1567. I purchased the pattern for the skirt as I like the lines and thought it would be fun to make. I was pleasantly surprised by the top. It's a simple to make piece. Only took me about an hour from cut to finish. Take note that the shoulders are quite wide. To keep the top from falling off my shoulders, I added bra loops. Did the trick and I wasn't pulling at my top all evening. It's a great pattern and one that will easily translate into a dress. Now to get the skirt finished! Congratulations Marie!!! Be sure to email me, sewbussted@yahoo.com, with your address so I can pop this in the mail. Today is my birthday, and as promised, the first day of the sewing caddy giveaway. Not too many responded, so all the better for all of you who did! Kathy blogs at Hazel's Daughter. Be sure to pop over and say HI! I'm off for a birthday massage :) Lucky Me!!! Wishing you all a very special day! It's that time of year when we all get a little crazy. I am doing my utmost best to keep my days as stress free as possible. A little decorating later today. I have orders for the pickles that I make, so that's on the to do list, but...I plan on getting in some walks and at least 1 yoga class this week. A few days ago, the video below was posted on Facebook and I was so inspired. You may have seen it, but if you haven't, by all means, take a look. It's just a little over 2 minutes long, so it won't take any time at all. 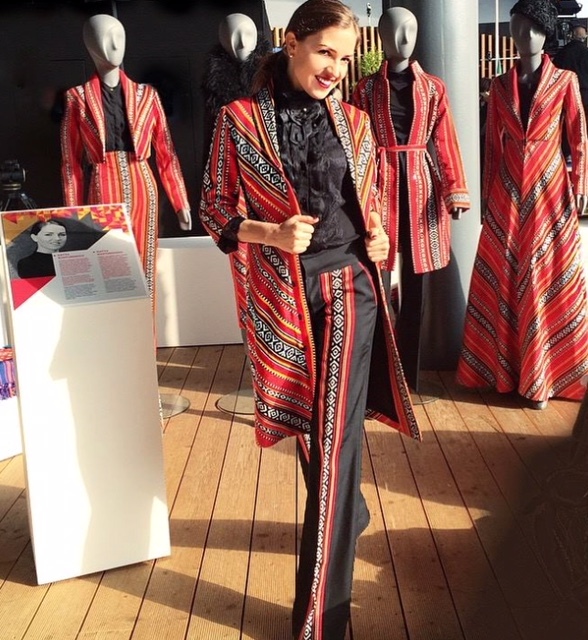 Absolutely love how the traditional Sadu fabrics of the Bedouin women have been used in such a lovely, modern, and yet, respectful manner. The designer, Katya Kovtunovich in and surrounded by her designs. I love the inspiration of the stripes. Just a touch on this little black dress. My favorite piece of all. Such a fun use of the stripes. Katya's story is really quite interesting. Her parents felt that although her dream was to be a fashion designer, she should pursue something that would give her a better chance at success. She became a writer for Vogue magazine, but ultimately pursued her dream. You can read her story HERE. It's a little long, but well worth the time. There was an episode of the television show, 'Friends,' where Phoebe wanted so badly to be Monica's maid of honor. But, of course, Rachel thought she should be the maid of honor. Realizing that she had lost the battle, Rachel said, "well, okay, let's see how Monica likes your Voodoo Hippie bridal shower." My quote isn't exactly perfect, but it was the Voodoo Hippie part that stuck in my mind as I thought it was hilarious! Now, I finally have a place where I can use the words!!! I love chili. There's just something about a bowl of chili that warms my soul. My only problem with making chili is that I like it rather spicy. 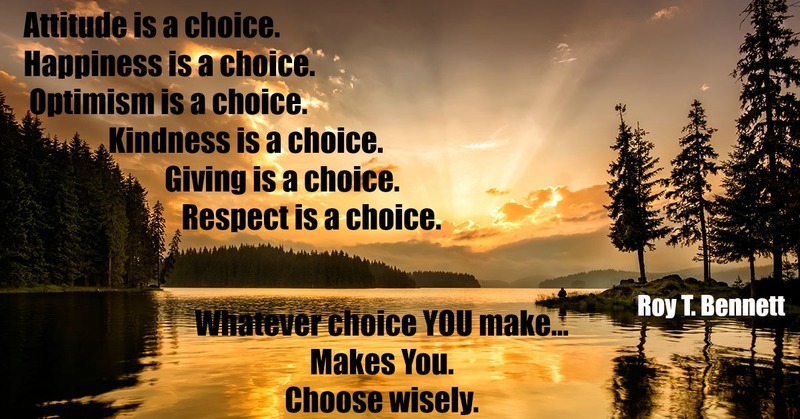 After setting many mouths on fire, I have learned to turn down the heat, and allow all to add their own level of fire! 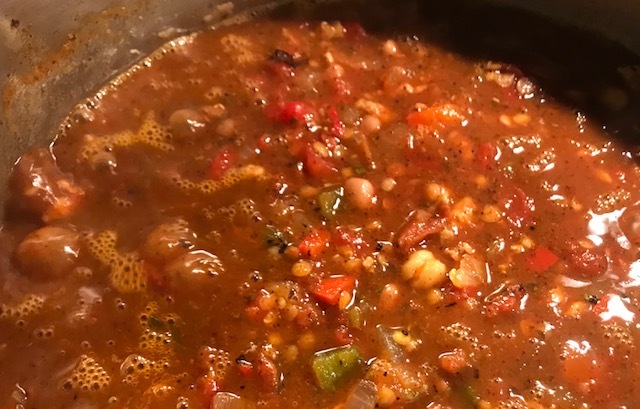 So, the only magical aspect of this chili is that it tastes great just as it is, and all can customize it for their own level of heat. Add garlic, canned tomatoes, red lentils, garbanzo beans, pinto beans, bay leaves, oregano, dried cilantro, chili powder and vegetable broth. Bring to a boil, reduce heat, and allow to simmer until lentils are tender, about 20-30 minutes. Heat oil in a large soup pot. Add onions and saute until tender. Add green and red peppers and saute about 10 minutes over a medium flame. Add garlic and saute another minute, being careful not to burn the garlic. *If you would like a non-vegetarian version, add meat or sausage of choice at this point. Brown until cooked through. Add lentils, diced tomatoes, bay leaves, oregano, chili powder, dried cilantro, and vegetable broth. Bring to a boil, and then reduce heat and cook until lentils are tender, about 20-30 minutes. Top with slices of jalapeno peppers, chopped green onion, grated cheddar cheese, sour cream, and/or sliced avocado. 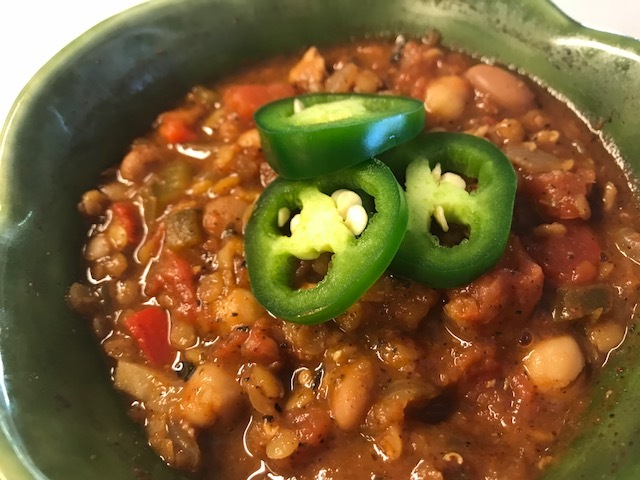 A great idea for a casual party is to make the chili and then have toppings available on a buffet so all of your guests can customize to their preference. Hope you will make a little magic of your own! 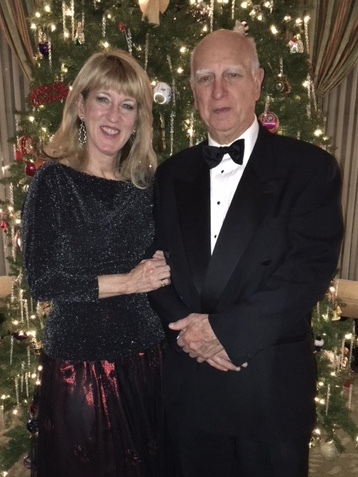 I had a wonderful evening last night. I had the opportunity to attend the annual fashion show at Fleet Feet Sports here in Chicago. The store has a very inspiring history. In 1976, running was a male dominated sport, but 2 women, Sally Edwards, and Elizabeth Jansen, only 28 years old, both teachers, and best friends, decided to go against the odds and open a running store. They purchased a run down, old Victorian home in the poorest area of downtown Sacramento, CA and opened Fleet Feet Sports. This powerhouse combo began a lot of firsts in the area, the first marathon, the first fun run, and the first triathlon. It wasn't long until they opened a second location and people began to ask about opening their own Fleet Feet stores. Now it's a chain that spreads across the United States. Each store is locally owned and operated, and committed to enhancing the local running and walking communities. Saw lots of fun things last night. There was a jacket that was a combo jacket and vest. It was held together as a jacket with magnets, so just a matter of pulling the upper jacket portion away from the vest. There was a zippered back pocket for storing the upper portion of the jacket. Such a great idea for days when you begin the workout and it's cool and then you heat up and need to pair down. When the model pulled away the top of the jacket, she threw it to me, so I was able to take a closer look. Then she came back and had me push the piece into the back pocket. Fun! They also had a jacket that had a built-in piece that would go over the hand and act as a glove. I really loved that as I am always starting out with my sleeves pulled down over my hands until I begin to warm up. My actual birthday is December 12th, so a few days away still. I always like to do a little something fun for my birthday, so this year I thought I would host a giveaway that you might enjoy. You may remember the sewing caddy I made HERE back in October. It has become my favorite sewing companion. In case you missed it, I did a video on making 1 for yourself. The fun news is that I have 3 to give away. I will draw the first name on my actual birthday, Tuesday, December 12, 2017. The second on Wednesday the 13th, and the final on the 14th. If you would like the opportunity to win one of my little caddies, just leave a message on this post by Monday, December 11, 2017, 11:59 pm, CDT. It's a bright, sunny day here in Chicago. Not too chilly, 30 degrees, and getting above freezing a little later today. I began the day with a task that made me just a little nervous. The vet who did the second surgery on Gracie told me that I could easily take the stitches out of her ear and remove the stays :/ I decided that rather than take it all out at once, I would just clip the stitches and then work on taking the stays off tomorrow. Well, best laid plans...I clipped the stitches and low and behold, the stay on the back side of her ear popped right up. The stay on the inside of her ear simply fell out. Over and done! Her ear looks amazing and I can see that she is thrilled to have all of that off, and...fingers crossed, over for good. Now I can add veterinarian assistant to my list of abilities ;) Probably not!!! Last week I introduced you to Wendy of Fashion Over Fifty. 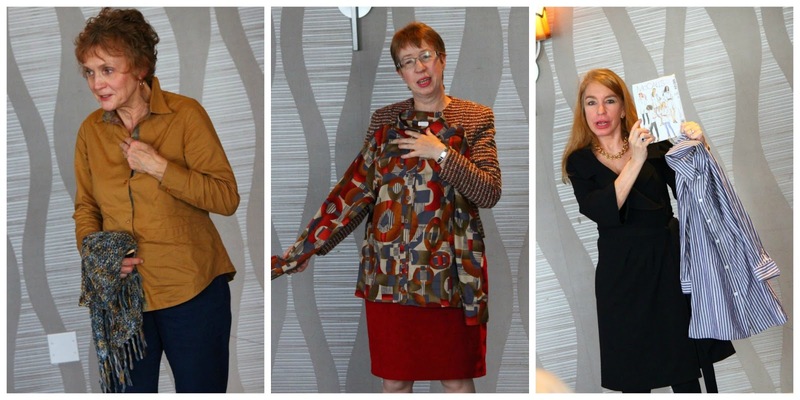 She was our featured speaker at the Haute Couture Club of Chicago's Holiday Luncheon. I thought that you might like to take a look at the post she did. You can find it HERE. This sweet lady has been a member for over 50 years. And she is not the only one. There are more!!! From the look on her face, you can see just how touched she was to be remembered. BTW, Wendy blogs at The Couture Counsellor. She's a lawyer by day, and an avid sewist by night. I introduced her to all of you sometime back, but if by chance you missed it, or have not checked out her blog, by all means do so, as I really think you'll enjoy getting to know her. Andrea is another who loves great fabrics. The jacket she is holding is lined in a Dolce and Gabbana silk charmeuse. Absolutely stunning. I'm not sure where she purchased the fabric, maybe while on a vacation. She purchased the silk charmeuse to line the jacket, and the embroidered fabric for a dress. She had just a few bits left over, and of course wanted to use each and every scrap, so she made the shirt she is wearing below. The embroidery was used for the front panels of the shirt, and the silk chameuse for the collar and cuffs. She said that the dress won't be worn all that often, but now that she's made the shirt, she'll get lots of wear out of the jacket. Such a great use of her fabric! Back in September, we kicked off our year with our very own member, Miss Cennetta of The Mahogany Stylist who did a wonderful presentation on shirt making. 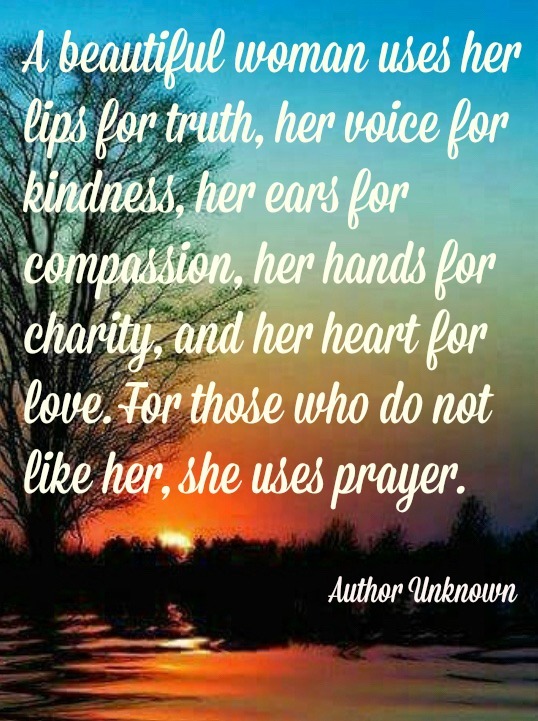 Below are a few of her inspiring makes. The party was so much fun. The shirt challenge was quite the success. We had a wonderful show and tell time. The ladies really pulled out all the stops with their lovely makes. Just such an inspiring day. 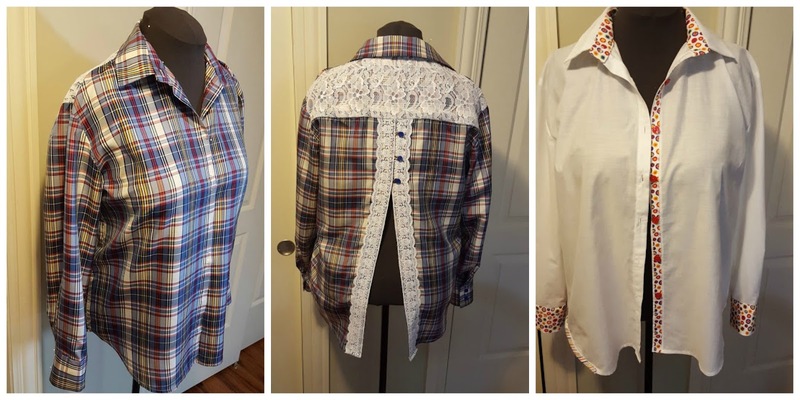 We even inspired Wendy of Fashion Over Fifty to learn to sew!!! If by chance you are anywhere near Chicago on May 6, 2018, we would love to have you attend our annual fashion show. It's such an inspiring day. Great to see women who not only make their clothes, but value quality. If you would like to check out our newsletter, Tailored Tales, you can find HERE. I love popping into a resale shop just to see what I can find. We were away over the Thanksgiving holiday, in a small little town up in the mountains. As small as the town is, they have a fabulous resale shop, in fact, I call it a department store as you can find just about anything you may need there. On this recent trip, I went in and found this little dress, and for some reason it spoke to me. 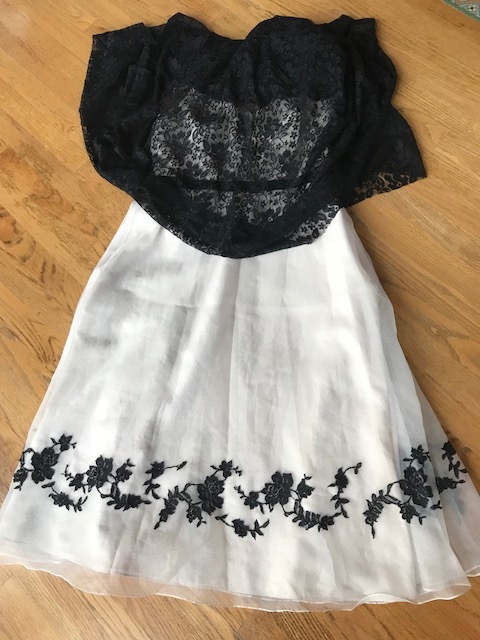 I rather like the black lace trim along the bottom of the skirt. 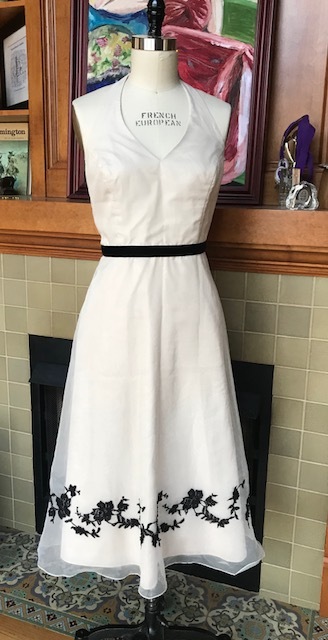 When I saw the dress, I thought, hmmm, I can do something with this, but it was marked at $15.00. Not that $15.00 is a lot of money, but it was just more than I wanted to pay for something I am going to tear apart. In the past, Mondays are half price clothing days, so I decided to wait. Monday finally rolled around, I happily went skipping back into the store thinking I would get my dress for $7.50, but was surprised to see that the clothing wasn't on sale. I asked, and I was told that they are no longer doing the Monday sale. Bummer :( But I decided that persistence can pay off, so I went back the next day. On that trip, I found a super cute belt that I can wear with my ski pants, and it was only a dollar...SCORE!!! But, no half-price clothing. So, I went back the next day, fingers crossed as it was my last chance before we left. No luck. I was so bummed that I just stood at the front of the store while my husband took a look around. As I stood there, the lady behind the register looked at me and asked if I bought the belt there at the store. I said yes. She commented on how cute it was with my ski pants. Totally unlike me, I told her that we had come back that day as I was hoping that it was half price day as there were 2 pieces that I wanted. The first was a little cashmere sweater that was completely trashed as it had holes in it, but it has beautiful rhinestone buttons. When I told her that it had holes in it, she said that it shouldn't be on the rack and that I could have it for free. Wow! But I told her no, the buttons are well worth $2.00 to me, so I would pay the $2.00. She asked about the second piece. I showed her the dress. She said that it had been there for quite sometime and that she would mark it down to $5.00. WOW, again! 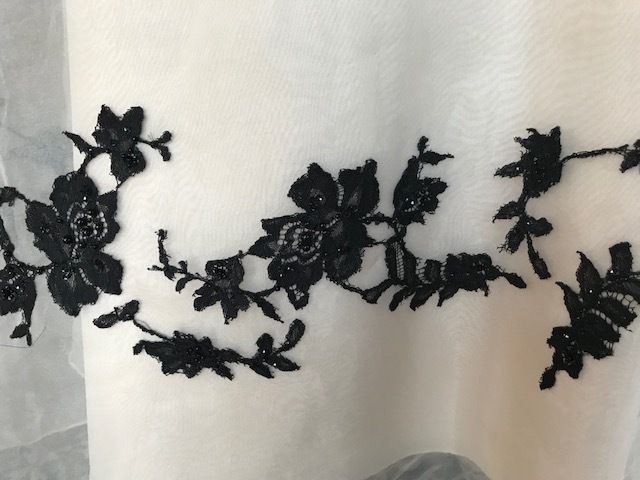 When I purchased the dress, I thought I would take the top off and add a velvet bodice, but then I remembered that I have this piece of black stretch lace. As I said, I initially thought that I would take the bodice off, but when I laid the dress down and threw the lace over it, I changed my mind. I think I may keep the bodice and cut the halter straps off, making it a bustier. I would like long lace sleeves and a lace overlay. So, I'll see how it turns out. I also plan to add more beads and sparkle to the lace along the hem, make it a little more festive. It'll be fun to see how it all comes together. I'll be working on this later today, so I should be able to share the finished dress on Thursday. As I was leaving an evening mass service, a young woman, holding a basket of purple ribbons, reached out with one in her hand and cheerfully said, "This is to remember that October is domestic abuse month." Taking the ribbon in my hand, I looked at her and asked, "So...what does this mean?" She replied that it was just a reminder that it was domestic abuse month. I then asked, "But what does wearing a ribbon do? What is the action that is being taken? Is the church doing something?" At that point, she clearly didn't know how to respond. She just looked at me and said, "We're just asking that you wear the ribbon." As my husband and I drove home, I thought about a day not long after we began dating. A friend of mine who was in her senior year of dental school and needed to begin seeing patients had asked if I would like to come in. Dental coverage had just been added to my insurance plan, so why not? I had thought that it would be rather fun, I would go in, get my teeth cleaned, we would laugh a bit, and that would be the end of it. But, being a good dental student, she talked me in to having x-rays, and it was then that she discovered a mass in my lower left jaw. Nothing was said at that initial visit. She showed her findings to the head of the school who then saw me at my next visit. He told me of the mass and that it needed more examination, as it could be a cyst or a tumor. The news was shocking, it was a tumor. I left in a fog, not even knowing how to process what I had been told. My husband, whom I was dating at the time had taken the afternoon off so we could go canoeing. When I arrived, I laid back on the sofa, and said the words for the first time, "I have a tumor in my jaw and they won't know if it is cancerous until surgery is done." The next few weeks were a whirlwind of activity. Root canals were done in order to save my teeth, lots of x-rays taken, and consultations. In one consultation, the surgeon told me that this type of tumor is caused by severe trauma, and then asked, "Have you been in an accident, or suffered a severe blow to your face?" I lied, I lied and said no. The surgery was preformed, and happily, no cancer was found. But I was told that I would ultimately need reconstructive surgery, and that I would know when it was time. Fifteen years later, I began to have horrible headaches on an almost daily basis, and there was a small mass in my jaw. I was told when I had the surgery to remove the tumor, I had an 80% chance that it would return. My dentist sent me back to the school where the surgery had been performed. When the surgery had been done, I was told that in the history of that school, they had never seen a case like mine, and from that point forward, my case would be the final test for all graduating oral surgeons. So, now here I was, back again, nervous, not knowing what to expect. A lovely woman walked into the room, paused, smiled and said, "So, it was you." She had graduated from this school and had my case as a graduating oral surgeon." Now here she was, the head of the school and would have the opportunity to fix what the tumor and time had done. As we talked, I felt comfortable, but the fact that I had lied all those years ago was still nagging at me. So I said, "I need to tell you the truth. I was in a very abusive relationship where I suffered many blows to my head and body. When the tumor was found and I was asked, I just couldn't tell the truth." Tears welled in her eyes, and she whispered as if she was talking to herself, "The missing link, what you must have gone through." She said that she had wondered how this could have happened, but since I was only 23 years old at the time, she never would have imagined that I had experienced what I had. She then looked at me and asked, "And life now???" I smiled, "I am now married to a wonderful man who truly loves me. No comparison to what life was like so many years ago." Back in September, I saw this picture in a Yahoo article. Not a real bruise, makeup. 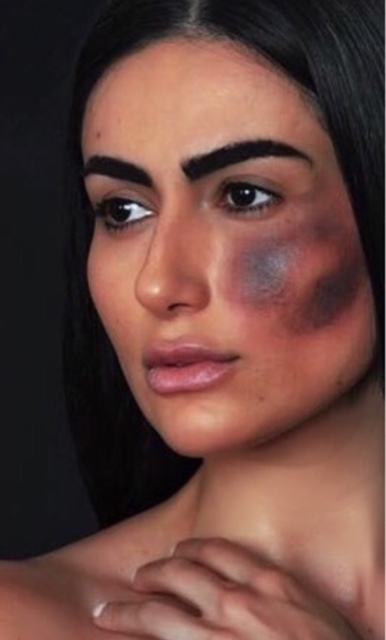 The picture was posted by Diala Makki who was trying to bring attention to domestic violence, and she added the question. "How would you react if this was not makeup?" But, more often than not, it's a face like mine that represents the scars of domestic violence. Those who experience domestic violence do their best to cover their bruises, hide their pain, and like me, will lie. Not to protect the abuser, but to cover their shame, a shame that does not even belong to them. But what lies beneath the smile is quite gruesome. Below, a picture of what can happen when someone either enjoys inflicting pain upon another, or who feels that they have the right to use their might to try and control. This x-ray was taken just after surgery, so the braces are still intact. But if you look above the teeth, you'll see plates on either side of my face, another just below my nose. There are plates and screws on either side of my nose that you can't see in this picture. More screws and small plates can been seen along the lower jaw. What most want to know is why...how??? I've even been asked, "Didn't you know before hand?" That question is like putting the blame back on the victim. There are answers to why and how, of course, but for another day. The best part of the story is that I was able to escape, and when I did, I promised myself that this would never happen again. Not all share my story and many remain in abusive relationships for years upon end. They have no resources, no power, and then there may be children that makes escaping all the more difficult. So, what would you do if you knew someone who was being abused? By all means, do more than just wear a ribbon, and please have compassion. There's little I love more than to go to the grocery store and allow what's there to inspire me. I also LOVE hominy. I grew up eating hominy with eggs and as a side dish. However it's given to me, I love it! 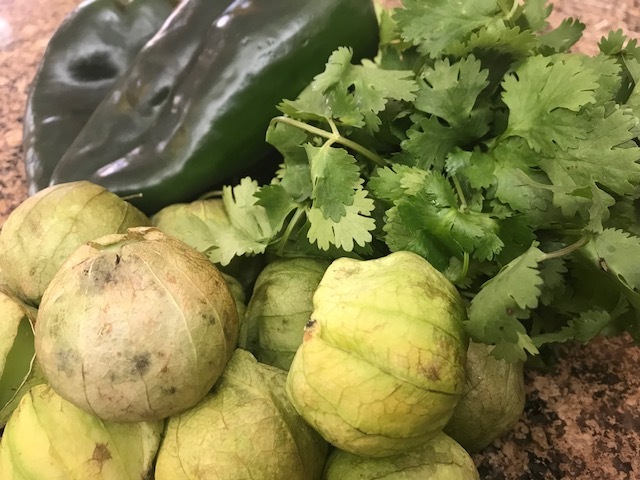 On a recent trip to the store, the tomatillos seemed to just jump right out at me. The poblano peppers also looked great, so I decided to try my hand at a little something different. Below you see the poblano peppers, fresh cilantro, and tomatillos. 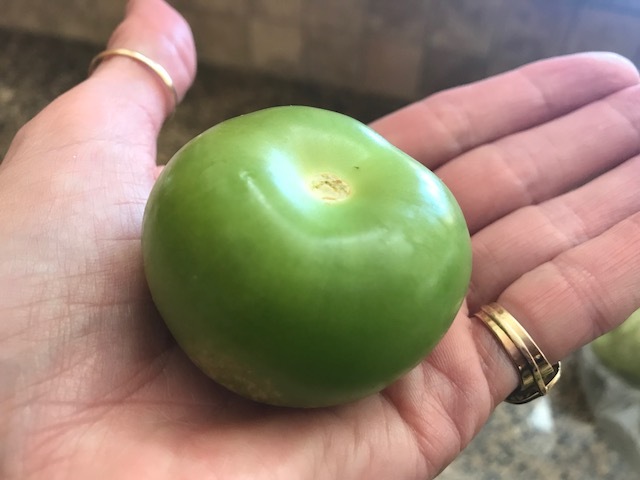 If you've never used tomatillos before, they look like little green tomatoes in a paper thin husk. 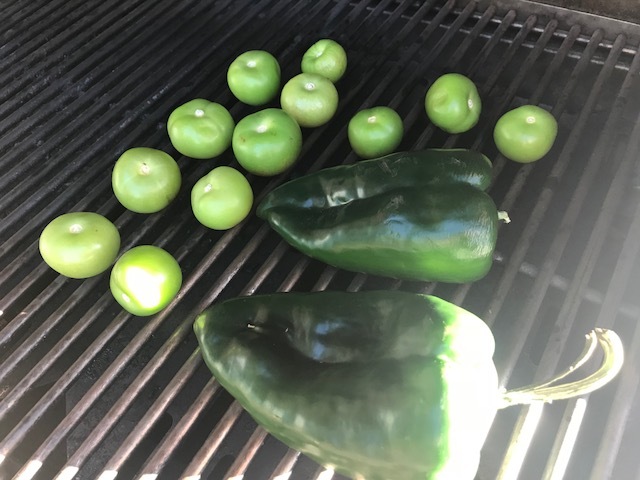 I began by roasting the tomatillos and the poblano peppers on the grill. 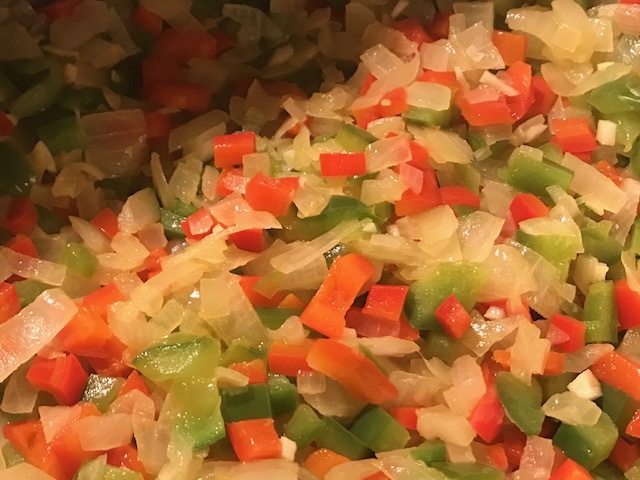 If you decide to give the soup a try, don't skip this part as the roasting gives the soup such a wonderful flavor. Just be sure that the grill is nice and hot before putting the vegetables on the grill. Roast the tomatillos until they are brown and have softened. Place in a blender and blend well. 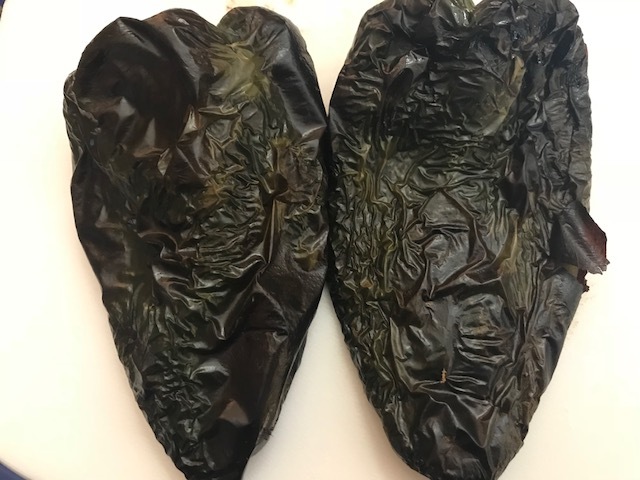 The poblano peppers should be roasted until they are really quite black on the outside. Pull off the blackened skin and pull the seeds out of the peppers. 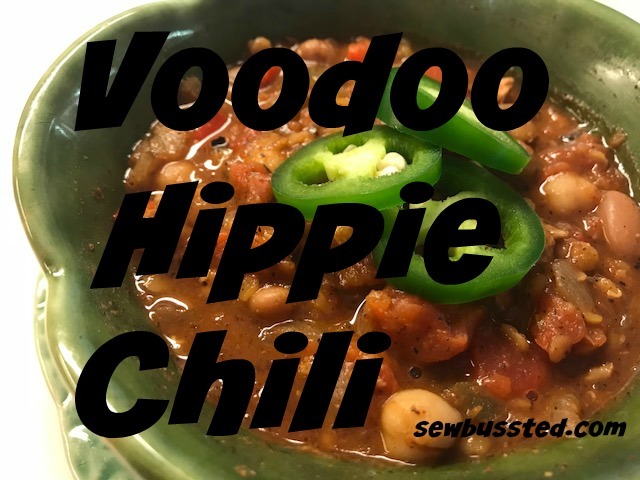 Poblano peppers are not hot, so this is not a hot, spicy soup. Chop the peppers and put aside. Add oil to a large soup pot and add the chopped onions. Saute until tender. Add garlic and saute another minute to allow the garlic to release its flavor, but not burn. 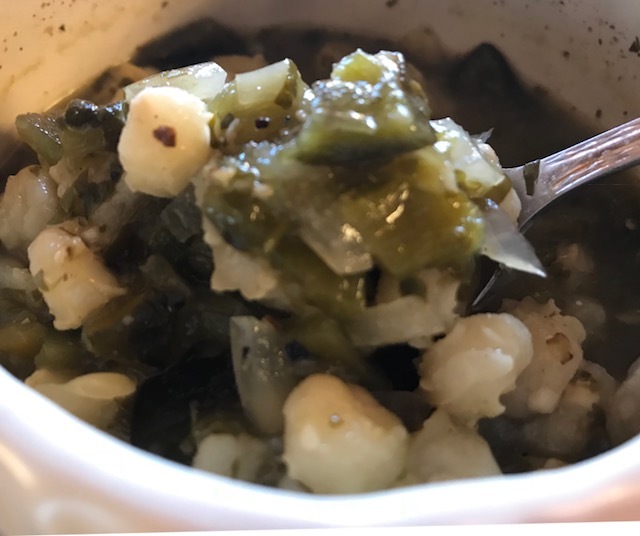 Add the blended tomatillos, chopped peppers, and hominy, to the pot along with 4 to 6 cups of vegetable broth. Bring to a boil and then reduce heat. Add 1 cup of finely chopped cilantro, 1 teaspoon of coriander, 2 teaspoons of cumin, and salt and black pepper to taste. Allow to simmer for approximately 20 to 30 minutes, just giving the spices time to flavor the soup. The final soup is absolutely delicious, low in calories, and yet the flavor is so robust that you'll feel you've sinned! I have loved every bite!!! 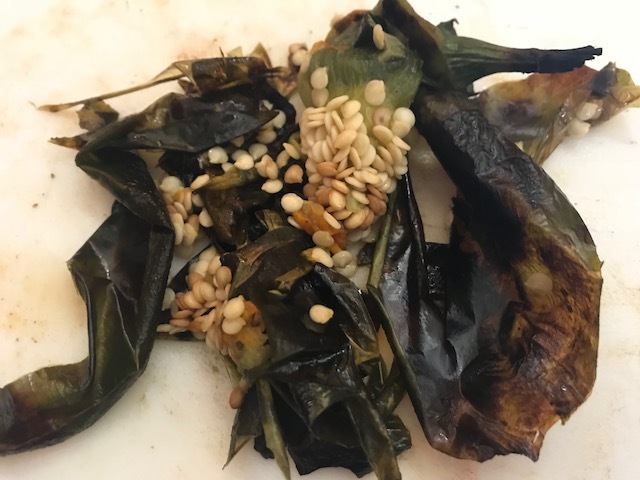 Place tomatillos and poblano peppers on a hot grill and roast until tomatillos are brown and have softened. Poblano peppers should be blackened. 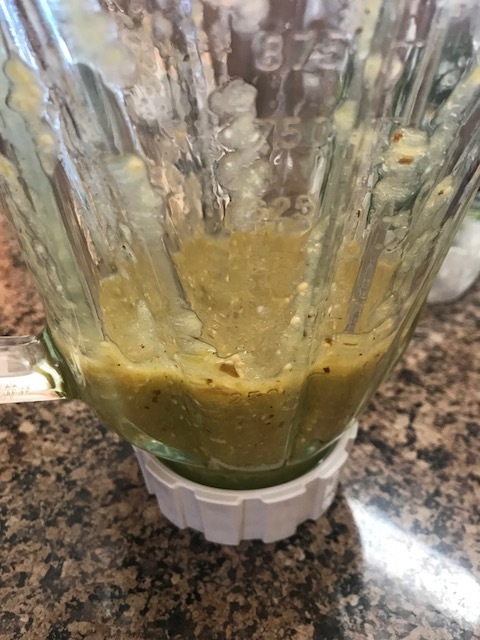 Place tomatillos in a blender and blend until smooth. Remove blackened skin from peppers and remove the stem and seeds. Chop peppers and sit aside. Heat oil in a large soup pot. Add onions and saute until tender. Add garlic and saute another minute to release flavor. 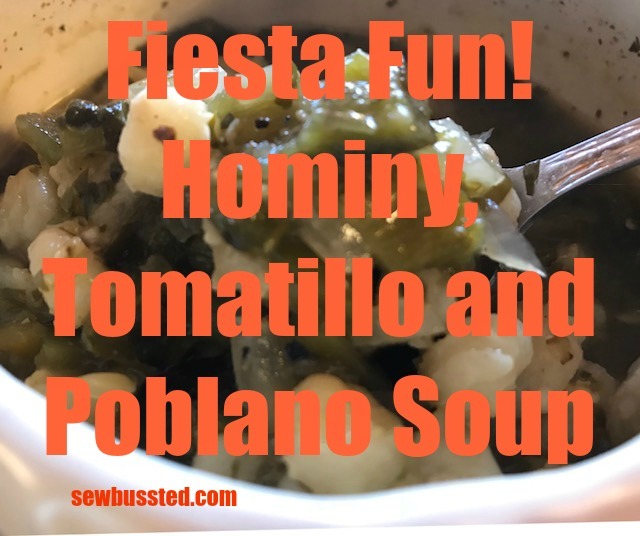 Add tomatillos, poblano peppers, hominy and vegetable broth. Bring to a boil and then reduce heat to simmer. Begin with 4 cups of broth and add more as the hominy begins to thicken the soup. Add cilantro, coriander, cumin, salt and black pepper to taste. Simmer for approximately 20 to 30 minutes. If you would like, top the soup with crumbled chihauhau cheese and chopped green onions. Serve with tortilla chips or a hot pan of corn bread. 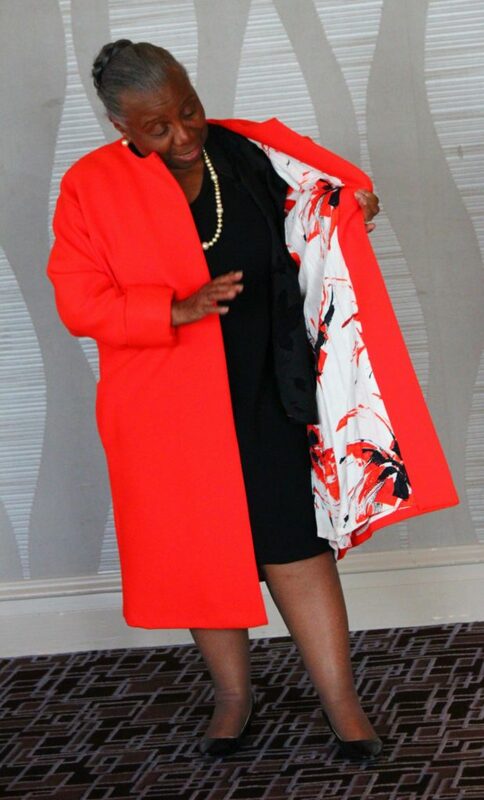 A few weeks ago I shared this coat that I have had forever. It's a faux fur coat that I really love. The fur is quite nice. While I won't wear it any longer as is, the fur can be saved, so I've decided to remake it. The coat is now apart, and I need to decide what to do with it. I have this trim which a friend gave me and I have been aching to use it. 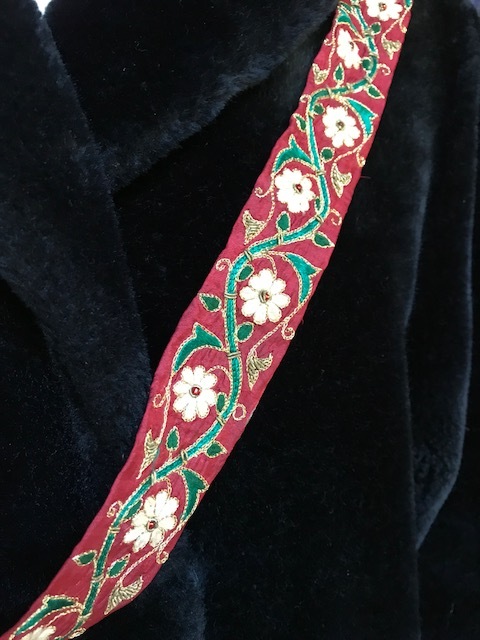 It may be a little difficult to see, but it has a lovely gold metallic thread that runs through it, and ruby beads in the center of the flowers. I have quite a bit, so there are lots of possibilities. I found this picture, and fell in love. I want a longer coat, so I thought I could do something to create a full skirt. I should actually have enough of the faux fur to create a great skirt. I really like this coat as well. I thought that I could use the fur and trim around the bottom of the coat and maybe mix it with a wool coating. 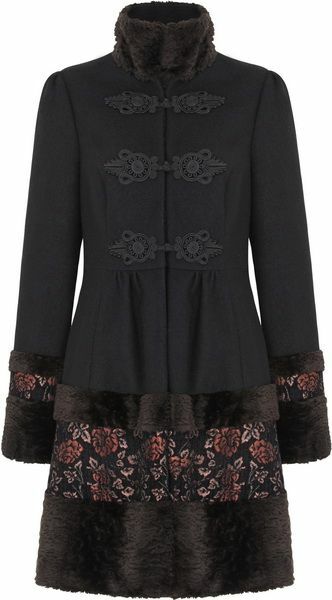 And then, OH MY GOODNESS, I love this coat!!! 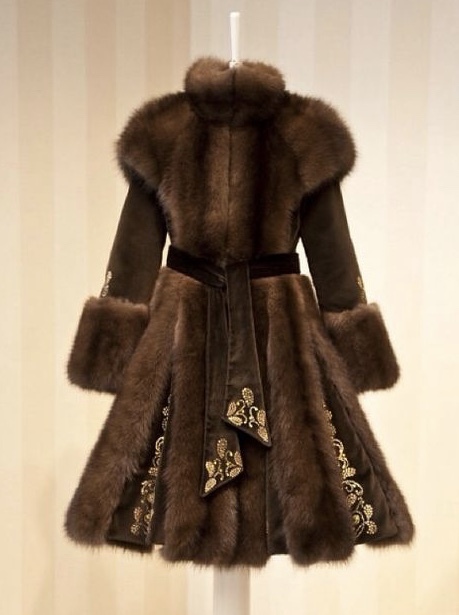 If I did this, I would forget the trim all together and mix the fur with a cotton velvet. All are quite dressy, so it's not a choice between something casual and something dressy. I would love your thoughts. Whatever I decide to do, it should be really pretty. The Wednesday Showcase/On Being Fabulous! Believe it or not, my most difficult birthday was when I turned 20. When I was a child, I dreamed of turning 13, it seemed to me a magical number. I would then be a teenager and my world would explode...parties, pretty dresses, driving, having a fabulous group of friends, even getting a job. The life I envisioned for my teenage years was very much out of a sitcom, Father Knows Best. Of course, no life is a television show, but what I got was far, far from what I dreamed. In fact, life was so difficult that I ended up with stomach ulcers at the age of 15. So when I turned 20, I mourned, I mourned for what I had dreamed, and what now would never be, at least that's what I thought at the time. One of my exchange students, being the cocky teenager that he was ;), asked,"Wouldn't you love to be 17 again?" He thought for sure that he had something on me, that I would love to once again be a teenager, like him! Since that 20th birthday, this was the first time that I actually thought about my age. As I thought, I realized that what I have now is SOOOO much better, and my answer was no. He was shocked! "But why, why wouldn't you want to be 17 again?" I replied that my teenage years were far from happy, but more importantly, what I have now, my life and what I can do, I wouldn't trade them for anything. And then I said, "Think about it, if I were 17 again, I wouldn't have you. You can be a challenge at times, but I wouldn't miss having had you come into my life just to go back in time." This student is now a grown man with a beautiful wife, a precious baby girl, and another baby on the way. In a recent conversation, we talked about that day, and I asked, "Do you understand now how I felt when you asked me if I would like to be 17 again? Would you possibly trade what you have now...for then?" There was a pause, and he said, "No, not for anything." 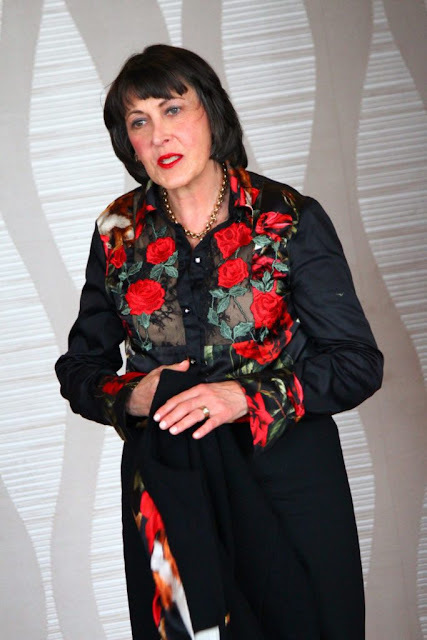 A few weeks ago, I had the opportunity to attend a brunch where Angela Missoni was the guest speaker. Talk about WOW!!! She was so lovely and such an inspiration. 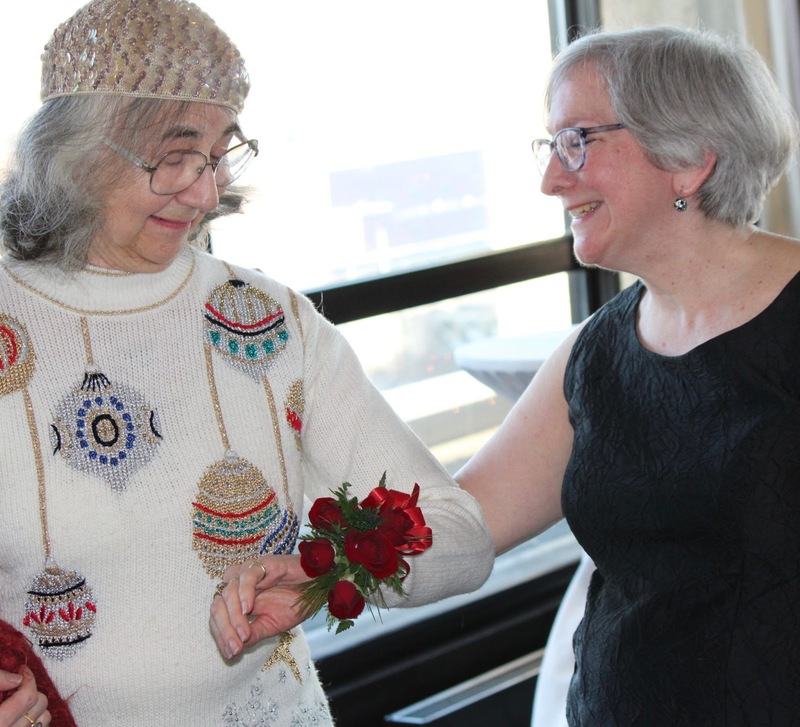 During the reception, I met a very interesting woman, Wendy Packer of Fashion Over Fifty. Her life story is quite interesting. She began life as a oncology nurse, became a lawyer, and then a mother. She began her blog as she has a passion for everyone, especially women to live life to its fullest. She feels that she has been "called to awaken every woman to the realization that she is full of wondrous beauty everyday she is alive." I love that! Since Wendy has had her blog, she has produced 3 fashion shows for Bloomingdale's, featuring models over 50. Her blog is full of wonderful tips, news on events, and fabulous ideas on dressing and pairing wonderful ensembles. I love this ensemble, especially the shorter pant style. I initially thought, Oh, I don't know...,"
But I really like how the shorter leg can showcase a great pair of shoes. As I said, Wendy has produced 3 fashion shows for Bloomingdale's. Here she is in a great another great ensemble. Love the leather pants. 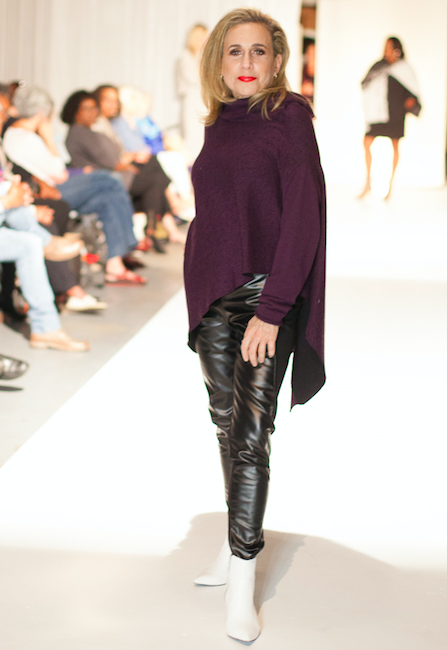 Don't be afraid to wear a pair of leather pants!!! It's all about how you wear them and with what they are paired. The draped top softens the pants and adds movement. The pants she is wearing here remind me of the Marcy Tilton pattern, Vogue 9035. Love the inspiration of not being afraid to show a little shoulder! Now for the best part, at least for me, aaaand if you are a member of the Haute Couture Club of Chicago, and will be attending our holiday party, Wendy will be our featured speaker. She will be sharing her life story, her tips, and fashion encouragement. She is so very excited to be around women who sew. She wishes she could sew, so maybe we'll be able to inspire her a bit too! She would like for everyone to wear their handmade garments as she would like to do a special post on the Ladies of Haute Couture. How exciting is that?!!! Be sure to check out Wendy's blog, Fashion Over Fifty. I think you will find her to be quite inspiring. When her post is up on the Ladies of Haute Couture, I'll let you know. Not Dead Yet Style is another blog that showcases women in their middle years. I'm sure most of you know about the blog, but just in case you don't, check it out, and be sure to check out her post, Visible Monday where you can broadcast to the world just how amazing you are! I will have a very special Sunday Night Reflection's post coming up on December 3rd where I will share a little of my life. I hope that it will be an inspiration. Now go out and shine!!!! !